In a press release issued on Wednesday, members of the recently formed Peoples Action Alliance of Bequia stated that they have been unable to confirm information published on the Internet that Government has already sold the crown lands on the south side of the island. 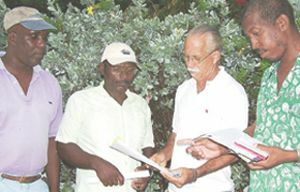 The citizenâs group states that they are awaiting a reply from the Prime Minister, Dr. Ralph Gonsalves, to their letter requesting a meeting with him on the issue of the sale of crown lands. The co-chairpersons of the committee which was set up on June 8th are Rocky McIntosh, businessman and former Senator, and Pat Mitchell, hotelier. Garfield Gurley, a secondary schoolteacher, was named secretary, and Joan Davis, office manager, treasurer. Owen Belmar, restauranteur, Herbert Raguette, labourer and president of a Friendly Society, and Hezron Leach, teacher and musician, joined the rest of the executive as spokespersons for the committee.